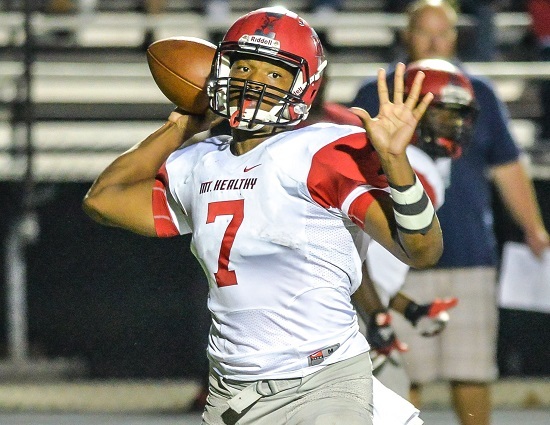 Mount Healthy quarterback David Montgomery capped off a great senior season by being named the 2015 AP Ohio Division III offensive player of the year. A well-deserved honor. His numbers were astonishing considering most teams keyed solely on him in the Owls offense. He ran 2,707 yards, threw for 726 more with 41 rushing and seven passing touchdowns in 12 games. Montgomery had a streak of nine consecutive games where he ran for at least three touchdowns. On 11 occasions Montgomery ran for 170 yards or more including three contests of 300-plus. Joining Montgomery on the First Team were teammate and offensive lineman, Justin Clark and a pair of stars from Trotwood-Madison, sophomore running back Raveion Hargrove and senior linebacker Roland Walder, the 2015 AP Southwest District defensive player of the year. Ends—Zach Rieman, Clyde, 6-foot-2, 175 pounds, senior; Tyler Adams, Louisville, 6-0, 175, jr; Justin Layne, Cleveland Benedictine, 6-3, 180, sr.
Linemen—Justin Clark, Cincinnati Mount Healthy, 6-5, 260, jr; Corey Crawford, Wapakoneta, 6-4, 270, sr.; T.J. Betalvski, Cleveland Benedictine, 6-1, 295, sr.; Alex Hall, Louisville, 6-6, 266, sr.; John Corcella, Bexley, 5-10, 170, jr.; Kyle Swinderman, New Philadelphia, 5-11, 265, sr.
Quarterbacks—David Montgomery, Cincinnati Mount Healthy, 5-11, 225, sr.; Logan Alexander, Elida, 6-0, 205, sr.; Jacob Adams, Louisville, 6-1, 185, sr.
Backs—Tyler Carter, New Philadelphia, 5-5, 145, sr.; Zacciah Saltzman, Athens, 5-11, 210, sr.; Raveion Hargrove, Trotwood-Madison, 5-7, 165, so. ; Nick Best, Bay Village Bay, 6-0, 205, sr.; Michael Warren, Toledo Central Catholic, 5-10, 200, jr.; Ronnie Kuipers, Columbus Independence, 5-11, 170, sr.
Kicker—Matt Goepfert, Rocky River, 5-11, 170, sr.
Linemen—Jonah Morris, Akron Hoban, 6-4, 200, sr.; Billy Cooper, Jackson, 6-0, 205, jr.; Adam Gilles, Columbus Watterson, 6-2, 208, sr.; Conner Bogard, Cleveland Benedictine, 6-1, 295, sr.; Nivek Lewis, Ashland, 5-11, 195, sr.; Ian Meacham, Toledo Central Catholic, 6-0, 245, sr.
Linebackers—Blake Bollon, New Philadelphia,6-1, 200, jr.; Zach Sandwisch, Toledo Central Catholic, 6-2, 215, sr.; Roland Walder, Trotwood-Madison, 6-3, 230, sr.; Leondre Crosby, Zanesville, 6-0, 220, sr.; Jacob Esarco, Canfield, 6-4, 243, sr.
Backs—Jacob Long, Columbus Hamilton Township, 6-1, 185, sr.; Warren Saba, Cleveland Benedictine, 5-10, 180, sr.
Punter—Zach Hoover, Toledo Central Catholic, 6-2, 165, sr.
Ends—Tyrell Ajian, Mansfield Madison Comprehensive, 6-1, 187, jr.; Adam Shaw, Carrollton, 5-8, 145, jr.; Alessio Amato, Zanesville, 5-11, 190, sr.
Linemen—Christian Swauger, Columbus Hamilton Township, 6-1, 280, sr.; Zack Yackey, Dover, 6-1, 270, jr.; Jacob Kepler, Akron Hoban, 6-0, 270, sr.; Zach Corrigall, Akron St. Vincent-St. Mary, 6-3, 265, sr.; Aaron Gregory, Norton, 6-5, 280, jr.; Coulter Wilson, Zanesville, 6-6, 315, sr.
Quarterbacks—Hunter Sexton, Jackson, 5-11, 215, sr.; Logan Bitikofer, New Philadelphia, 6-4, 190, jr.; Dom Davis, Akron St. Vincent-St. Mary, 6-1, 185, sr.; Cameron Searight, Chesterland West Geauga, 5-11, 185, jr.
Backs—Nate Rosenbauer, Chillicothe, 5-9, 170, sr.; Derrione Leeper, Columbus Marion-Franklin, 5-10, 225, sr.; Todd Sibley, Akron Archbishop Hoban, Jr., 5-10, 205; Tray Smith, Painesville Harvey, 5-9, 175, sr.; Jakob Prall, Tipp City Tippecanoe, 6-2, 179, sr.; Trevor Thome, Medina Buckeye, 5-8, 180, sr.; Dylan Garver, Poland, 6-0, 185, sr.
Kicker—Dominic DiMaccio, Columbus DeSales, 5-8, 160, jr.; Grant Kersh, Akron Hoban, 5-11, 180, jr.
Linemen—Willie Ross, Ravenna, 6-2, 255, sr.; Tristen Cox, Piqua, 6-4, 331, jr.; Dillon Allen, Dayton Thurgood Marshall, 6-4, 285, sr.; Derrius Mullins, Columbus DeSales, 6-4, 315, jr.; Bryce Hargrove, Coventry, 6-6, 260, sr.; Manny Carrillo, Bowling Green, 6-2, 250, sr.
Linebackers—Davvel Moore-Meeks, Cleveland Benedictine, 6-2, 195, sr.; Joe Fornaro, Chesterland West Geauga, 6-1, 210, sr.; Victor Williams, Warren Howland, 6-0, 185, jr.; Dane Kersh, Akron Archbishop Hoban, 6-2, 220, sr.
Backs—Joe DeBarr, Bay Village Bay, 5-10, 180, sr.; Cole Gergye, Bay Village Bay, 6-3, 185, sr.; Jack Corrigan, Rocky River, 6-2, 190, sr.; Riley Hadden, Tipp City Tippecanoe, 6-0, 149, sr. Punter- Quincy Colvin, Columbus Eastmoor Academy, 5-11, 245, sr.; Will Hart, Hunting Valley University School, 6-3, 190, sr.
Ends—Eean Hornung, Mount Orab Western Brown, 5-10, 165, sr.
Linemen-Maxton Edgerly, Bay Village Bay, 6-4, 255, jr.; Hunter Gray, Medina Buckeye, 6-1, 228, jr.
Backs—Cameron Lauck, Wapakoneta, 5-10, 170, sr.; Markus Hurd, Akron St. Vincent-St. Mary, 5-10; 185, sr.; Jemarulin Suggs, Akron East, 5-11, 180, jr.
Linemen—Mason Giordano, Canfield, 6-2, 250, jr.; Tommy Carnifax, Warren Howland, 6-5, 250, sr.
Linebackers—Ryan Corkrean, Columbus DeSales, 6-2, 215, jr.; Jared Cockerell, Wapakoneta, 6-1, 205, sr.; Derek Grosse, Thornville Sheridan, 5-10, 185, sr.; Caleb Shroyer, Bellbrook, 5-10, 183, sr.
Dylan Beaugard, Wilmington; Trent Clark, Trotwood-Madison; Tyler Sammons, New Richmond; Andrew Reenan, Cincinnati Northwest; Darien Tipps-Clemons; Davian Lankford, Dayton Belmont; Paul Young, Hamilton Ross; Nick Staderman, Cincinnati Archbishop McNicholas; Payton Standifer, Franklin; Logan Eldridge, Greenville; JaVonte Williams, Cincinnati Mount Healthy; Thomas Richardson, Dayton Thurgood Marshall; Trenten Scott, Franklin; Brandon Gottherdt, Tipp City Tippecanoe.